You are here: Home Books Scott Feschuk wonders, where are all the flying cars? Feschuk has a distinct sense of humour and a casual, incisive writing style that grabs the reader right from the opening paragraph and holds their attention throughout. It’s easy to see why he is a two-time winner of the Gold Award for Humour at the National Magazine Awards. While critiquing the state of modern innovations, Feschuk also manages to work in many clever jabs at celebrities including Nicolas Cage, Cher, Ryan Seacrest, Jude Law, Rob Ford, and Kirstie Alley. When you think about all the brainpower being used to create consumer products, it makes you wonder what could be accomplished if those minds were put to more productive use. For example, as Feschuk points out, Procter and Gamble have recently come out with a breakthrough in razor technology — a handle that pivots. “Gillette’s Fusion ProGlide razor with FlexBallTM Technology is so powerful that it allows capital letters to be placed in the middle of made-up words,” explains Feschuk. 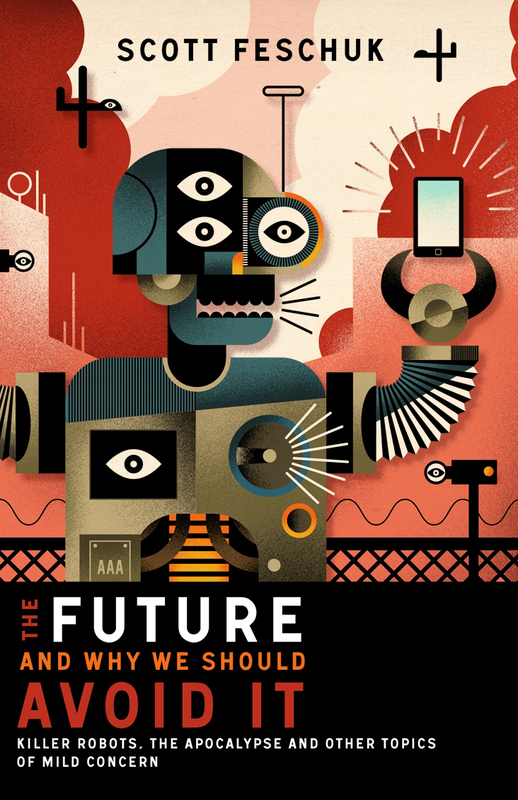 There are a couple of chapters that read like a collection of ramblings or complaints about society, and these don’t quite fit in with the rest of the book and its theme of discussing innovations for our future. For instance, I found “Arts and Entertainment” to be the weakest section — unless, of course, you really want to know whatTransformers 6: The Hangover would be like. Inevitably, talk of the future leads to talk of aging and death. Feschuk discusses the many wonderful things we can look forward to in old age, such as memory loss, hair loss, and various other kinds of loss. On the upside, there may be hope for immortality thanks to Ray Kurzweil and his nanobots. But would we really want to be immortal? As Feschuk points out, the present was once the future and it’s not that special — so don’t get your hopes up.